Sarah Altemus-Pope, executive director for the Southern Willamette Forest Collaborative, describes the efforts to reduce wood smoke pollution in Oakridge as a contentious issue, and said community members see it as an act of over-regulation by the government. Jo Niehaus, public affairs manager with LRAPA, said the cultural history of the town is also a limitation to improving air quality. “A place like Oakridge – where wood culture is really ingrained – retraining folks and helping them get access to resources has been a challenge,” she said. Oakridge used to be a logging town, but according to a 2006 article in The New York Times, the last mill closed in 1990 and there have been increasing rates of poverty ever since. But many Oakridge residents are still attached to the old ways of cutting their own wood. Furthermore, Niehaus said there is reluctance to believe individual actions will amount to large-scale changes. “As an individual, it’s hard to fathom that my one action will make a difference,” she said. There has also been controversy over where the air quality monitor is placed. Currently, it’s located where the air quality is the worst. Coey has argued for having two monitors, one up on the hillside – where the air quality is better – and the other down in the valley, and averaging the two. But, Niehaus said that would be financially unsuitable for how small the town is, and the purpose of the program is to improve air quality in all parts of Oakridge. “If you can improve air quality in the worst polluted place, you’re improving it everywhere,” Niehaus said. 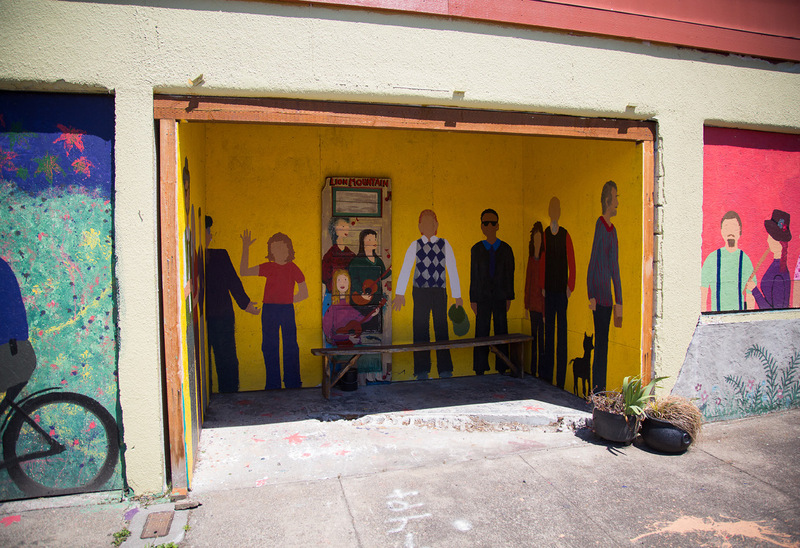 Where a popular bakery once stood, a mural depicting community members commemorates the loss of a local business. The town has suffered from a disproportionate number of fires that caused irreparable damage. The history of air quality improvement in Oakridge is extensive. According to the Lane Regional Air Protection Agency’s (LRAPA) 2016 attainment plan, Oakridge was first declared in moderate nonattainment for particulate matter 10 in 1994. At this time, the EPA required PM 10 to be below a three-year average of 65 micrograms per cubic meter. The city of Oakridge, LRAPA and the Oregon Environmental Quality Commission adopted an attainment plan in 1996 and achieved it, on schedule, in 2001. But five years later, the EPA increased restrictions on PM 2.5, creating the standard that exists today — which is not to exceed 35 micrograms per cubic meter of PM 2.5 over a three-year average. The most harmful type of particulate matter is PM 2.5 because it is small enough to affect the lungs. One human hair is about 30 times larger than PM 2.5, according to the EPA. Asthma and increased respiratory problems are some of the potential health effects of air pollution. Once again, the institutions adopted a new 2012 attainment plan. While the particulate concentrations from 2013 to 2015 were the lowest recorded in Oakridge’s history of recording for particulate matter, they still weren’t on track to reach attainment status. The city applied for a one-year extension from the EPA – making the new deadline 2016. Oakridge achieved a level of attainment that year. However, every year is critical and in 2017 Oakridge reported an average of 36 micrograms per cubic meter for PM 2.5. This result didn’t greatly affect the latest three-year average, which is 29. However, if the city continues to end the year with high averages, it could move Oakridge back into nonattainment status. House Bill 3068, which was passed in 2015, required the Department of Environmental Quality (DEQ) to form a workgroup that could make recommendations to reduce wood smoke. The workgroup recommended increasing state funding for local communities from $170,000 to $550-$700,000 per biennium. As a result of this workgroup, Oakridge received a $75,000 grant from the Oregon DEQ, said Coey. “We’ve done this for under $100,000. Fixed the problem. But it’s not maintainable that way,” Coey said. 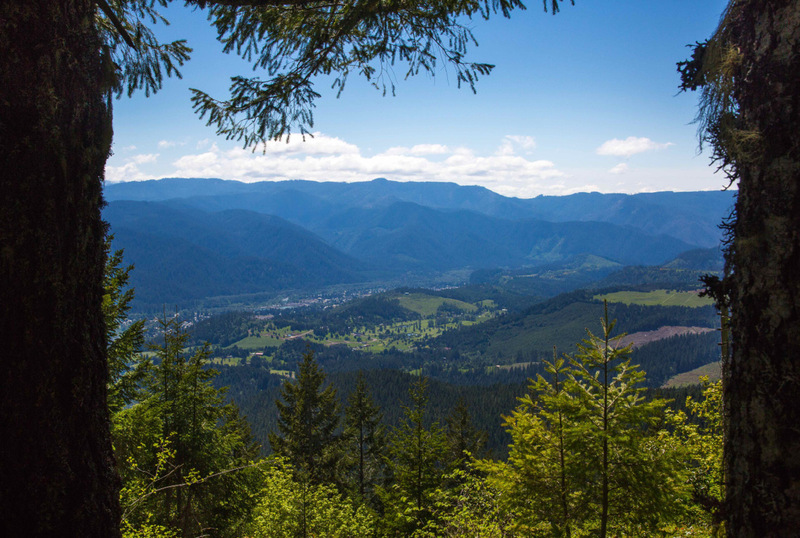 The view from Oakridge’s Dead Mountain allows visitors to see the unique structure of the town’s geography. Nestled between hills on three sides and the Willamette River on the fourth, the area is prone to stagnant air and temperature inversions. A place like Oakridge - where wood culture is really ingrained - retraining folks and helping them get access to resources has been a challenge.